Natalie Spooner led Canada’s national women’s team with four points in the season-opening action as they prepare for the 2018 PyeongChang Winter Olympics. They skated away with a 2-2 record at the Icebreaker tournament against the Alberta Midget Hockey League AAA boys teams in Calgary Sept. 21 to 24. “When you’re competitive, the results always matter; we want to win every game we go into. But it’s nice to know also that you’re improving as a player, getting your feel back, your touch back with the puck. It was great to have scrimmages against each other, but it’s always great to play against other opponents other than your teammates to get things going before the (Esso Series) kicks off,” said Natalie Spooner after stepping onto the ice for games after a month of practices and intra-squad scrimmages. Canada opened the Icebreaker tournament with a 4-2 loss to the Calgary Northstars and then bounced back to defeat the Northwest Calgary Flames 4-1. 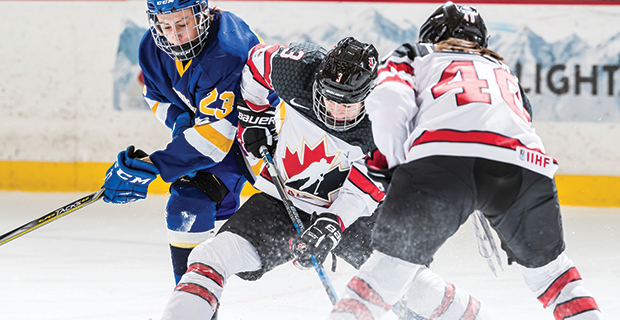 Marie-Philip Poulin’s two goals lifted Canada to a 3-1 win over the Calgary Royals and then Canada fell 4-0 to the Northstars in their final game. As in years prior in the lead-up to the Olympics the national team will play games against the AMHL teams over the next four months. “The Esso Series is so valuable for us. [The Midget-aged players] help us raise our level of excellence — we saw it four years ago heading into Sochi. When we arrived in February, we were well-prepared. We want to replicate that. We want to finalize our team as well, and make sure we develop a strong team chemistry come February so that we’re ready when we get to PyeongChang,” said Team Canada forward Mélodie Daoust. Canada will be back in action at the WinSport’s Markin MacPhail Centre in Calgary on Oct. 1 to face-off against the Midget AAA Airdrie Bisons at 7 p.m.
“Everything that we’re going to be doing is going to be working backward from the Olympic Games. It’s quite different from regular club-team play where every single weekend matters in terms of whether or not you make the playoffs. For us, all of those games (in the Esso Series) are going to be opportunities to continue to own what we’re good at, and work on the things that we need to continue to work on so that come February, we are ready to go and we’ll be at our best performance,” said Canada’s head coach Laura Schuler.